To Each With Love is a play of human nature on a vibrant canvas portraying a diverse range of characters – some similar, still quite apart. The stories, being an expression of the experiential reality of contemporary Indian infrastructure, present a fascinating study of the relational script of people belonging to a varied social milieu. Ranchan’s stories have a strange charisma about them, and that is what seduced me to read them with pleasure and immense interest. They explore the hypocrisy of Indian society at every level, and she delves deep into the psychology of the devastating Indian Mother figure, who sustains, and at the same time devours Mother India. The long short story seems to be a new genre, perhaps, a new version of the novella. Renée Ranchan has made an interesting debut in this field. A perceptive and poignant analysis of Indian Society, mirroring as it does with tongue-in-the-cheek, the foibles and follies of our present-day social set-up covering its varied rungs. A treasure-trove to go back to again and again! Renée Ranchan covers an array of different characters from various walks of life in a single breathless sweep, in many ways reminiscent of an early Alice Munro. Having had long exposure to both the East and the West, she lends amazing depth to the stories, given her perceptive perspective on the changing values of present-day India. She paints, as if with the stroke of a brush, characters live and vibrant on the canvas. No wonder, her writings happen to transfer the medium of colour and contour to her picturesque words. And rich literary sensibility, undoubtedly, emboldens her style, uniquely her own. She plays with language freely and creatively, conveying images and emotions so aptly and precisely. 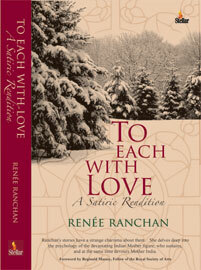 Though Ranchan has been a columnist and feature writer for various publications, she’s essentially a poet at heart. Her beautiful book of verse, Untwine the Wind, was widely acclaimed. A few years ago, she was chosen to be a Writer-in-Residence at Martha’s Vineyard, Writers’ Residency Program. Her interest in the writings of the Brontë Sisters also led her to recently pursue a study course at the University of Oxford. Presently, she is on a non-paid sabbatical, travelling terrains dissimilar.